If you are a therapist or coach of any persuasion; counsellor, psychotherapist, hypnotherapist, life coach, bodyworker, in fact anyone who works in the helping professions, you will glean valuable, actionable ideas, tips and techniques from Clear Thinking, my free therapy techniques newsletter. 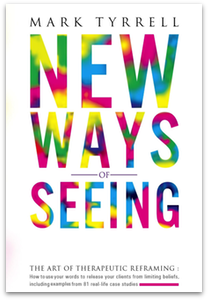 Get my new book 'New Ways of Seeing' free when you subscribe to my weekly therapy techniques newsletter. External discipline, when required, within a supportive environment may be the primer for the development of self-discipline. We all approach life’s crossroads sometimes. There are paths, maybe many, to choose from. Help your clients see things more clearly so they can move forward. When you’re not getting the results you want, stop what isn’t working and try something new and unexpected. Widen the way you see the problem. If we are to help our bullied clients, the first thing we need to understand is what exactly is happening when someone is being bullied. Help your clients beat bursts of heightened anxiety. Should You Ever Pass Judgement on Your Clients? Three tips to help you work effectively with clients who challenge your therapeutic objectivity. The sixth instalment in this occasional series continues to navigate the boundless ocean of psychological research. As terrible as depression is, some simple interventions can be surprisingly effective in relieving symptoms. Use these techniques to help clients rediscover their enjoyment of life.